The third wave of Hunt for the Decepticons deluxe-class toys have just been spotted in Target stores. These two, Terradive and Tomahawk, are joined by Electrostatic Jolt in the wave. The receipt is from Newpark Mall in California. Thanks to our own xterry for the head’s up! WfC Prime and Bumblebee along with HftD Sea Attack Ravage and Jetblade are the new Tuner Mudflaps. Wish that was the case in the UK. I've yet to see any Generations. I hope deluxe wave 4 is the last wave of movie toys. I'm personally tired of movie toys. I want more Generations toys. It's a pity that what the fans want there is very little, but the the stuff retailers want is a lot. I hope TF3' s subline does the opposite. Nonetheless, I might get Terradive and/or Tomahawk when they hit stores. I'm afraid 'the fans' don't all share your opinion… myself included. Also, the later Universe waves are still shelfwarming here, long after the ROTF stuff has sold out. PASS on Tomahawk cause he looks too much at a power ranger wanna be. Terradive is a must have for me!!! There have been occasional sightings of HftD Wave 2, but most of my local stores (especially Target) are packed with Wave 1, so I don't expect to see these at retail for awhile. Fortunately, Terradive and Tomahawk are both in my BBTS PoL, waiting to ship. Settle down, Lima will get its turn! Right after Miami. I still haven't found wave 2! You're so spoiled, in the 80's there was no reliable Transformers distributor in Lima. You had to go to the freaking Polvos Azules Flea Market. The other alternatives were Sears or Saga (not often, but they did have japanese toys). I hope you get them soon. the movie excitement has just died down for kids without any other (well-known) media to keep the hype up. I hope the stores and to an extent Hasbro are realizing that without a movie, a DVD, or a TV Series Cough TF rime Cough, kids have no appeal to getting the toys. Tim: He wasn't in the movie at all. Tim: I already have a bigger one. My consumption of new figures is certainly slowing down, if it already hasn't slown down. I don't see myself picking these up. Actually they cost $12.99 each. with tax in my state being six percent,the total cost is $13.90 each. My target was a bust…. Very little of the HFTD and PCC's at Walmart have come in order. My store received PCC waves one and two in the same week so who knows what's goin on. Well thats cool, at least they ARE coming out soon. 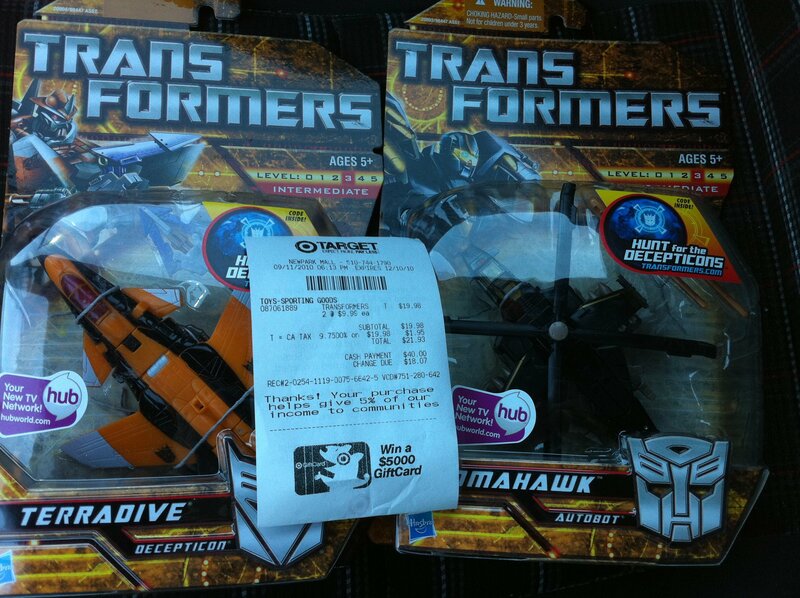 terradive & tomahawk are 2 deluxes on my must get list. as these toys look awesome in both modes & have great color schemes. I kinda like that fact that terradive looks a bit like that cybertron beast planet deluxe sized dino-bird. Ah! Tomahawk and Terradive, you shall be mine for christmas. muhahahaha! these items were on the Kmart web since 2 weeks 1/2 ago. these items were on the Kmart web since 2 weeks 1/2 ago. nobody check the stores web to see of they have it or not do your home work, grimlock, iron hide, and rodimus animated will be coming up soon at toy-r-s web, just keep on looking. I dunno, they initially had a TON of them around here, but the WfC duo is selling fairly quickly. Totally agreed on Ravage and Jetblade– I think it was mighty stupid of them to include two repaints of toys that were fairly shelf-warming when they were FIRST released in the first wave of a new toyline. Even Ironhide and to an extent Battle Blades Bumblebee are staying on pegs, though. I think the movie excitement has just died down for kids without any other (well-known) media to keep the hype up. -Anything yellow-box except Legends. These things are barely moving at all.